The Chelsea manager has been criticised for his pragmatic approach in recent weeks. 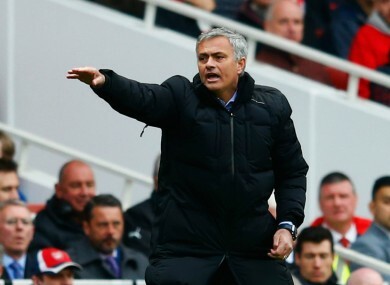 Mourinho has dismissed claims his team are boring. JOSE MOURINHO HAS once again slammed critics who brand his Chelsea side as boring, claiming detractors want a sterile game of football “played on the moon”. The Blues opened up a 10 point lead at the top of the Premier League table with a 0-0 draw against Arsenal at the weekend, but Mourinho was subsequently criticised for his pragmatic approach against the Gunners, which prompted the home fans to start chanting ‘boring, boring Chelsea’. The Portuguese has now hit back, however, and insists that the obsession with “ball possession” will lead to a game without goals. “People talk about style and flair but what is that?” he told reporters. “Sometimes I ask myself about the future, and maybe the future of football is a beautiful, green grass carpet without goals, where the team with more ball possession wins the game. “The way people analyse style and flair is to take the goals off the pitch. It’s the football they play on the moon — where the surface is not good, with some holes but no goals. “Everyone speaks about teams playing fantastically well because they ‘had great ball possession’. It looks like the goals aren’t important. They conclude a team that scores as many as we do is boring but a team with 70 per cent of the ball who don’t score isn’t. Mourinho also says that Chelsea owner Roman Abramovich — who is famed for craving an expansive style of play — is delighted with the way the Blues are playing, and has revealed that the Russian celebrated with the squad after their goalless draw at the Emirates. Email “Jose Mourinho has responded those 'boring, boring Chelsea' chants ”. Feedback on “Jose Mourinho has responded those 'boring, boring Chelsea' chants ”.